We’d love your help. Let us know what’s wrong with this preview of Abraham's Children by Jon Entine. Could our sense of who we are really turn on a sliver of DNA? In our multiethnic world, questions of individual identity are becoming increasingly unclear. Now in ABRAHAM'S CHILDREN bestselling author Jon Entine vividly brings to life the profound human implications of the Age of Genetics while illuminating one of today's most controversial topics: the connection between g Could our sense of who we are really turn on a sliver of DNA? In our multiethnic world, questions of individual identity are becoming increasingly unclear. 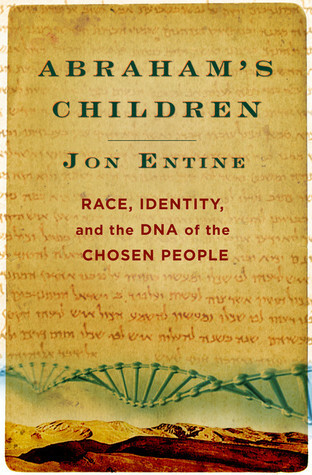 Now in ABRAHAM'S CHILDREN bestselling author Jon Entine vividly brings to life the profound human implications of the Age of Genetics while illuminating one of today's most controversial topics: the connection between genetics and who we are, and specifically the question "Who is a Jew?" Entine weaves a fascinating narrative, using breakthroughs in genetic genealogy to reconstruct the Jewish biblical tradition of the chosen people and the hereditary Israelite priestly caste of Cohanim. Synagogues in the mountains of India and China and Catholic churches with a Jewish identity in New Mexico and Colorado provide different patterns of connection within the tangled history of the Jewish diaspora. Legendary accounts of the Hebrew lineage of Ethiopian tribesmen, the building of Africa's Great Zimbabwe fortress, and even the so-called Lost Tribes are reexamined in light of advanced DNA technology. Entine also reveals the shared ancestry of Israelites and Christians. To ask other readers questions about Abraham's Children, please sign up. The most interesting parts of this book is the (poorly fact-checked) post-biblical history of the Jewish people. Even this part suffered from such gaffes as claiming that the Assyrians invaded Palestine around 600 BC and implying that events of 1158 were motivated by policies introduced in 1215. Credibility is further eroded by an author who treats "Marxism" and "Marxist" as pejoratives, and impugns the credibility and motivations of any academic researcher who has findings that disagree with the The most interesting parts of this book is the (poorly fact-checked) post-biblical history of the Jewish people. Even this part suffered from such gaffes as claiming that the Assyrians invaded Palestine around 600 BC and implying that events of 1158 were motivated by policies introduced in 1215. Lengthy and lacks and overall argument or position. Starts off quite offensive to those involved in interfaith relations (mentions the dangers of assimilation in the same sentence as the Holocaust). Muddle through a few hundred pages on the history of the Jewish people and FINALLY you get to some good stuff at the back about Jewish diseases and Jewish intelligence and the nature of race and ethnicity. But then the author starts discussing Antisemitism, and racism, and he honestly looses his voic Lengthy and lacks and overall argument or position. Starts off quite offensive to those involved in interfaith relations (mentions the dangers of assimilation in the same sentence as the Holocaust). Muddle through a few hundred pages on the history of the Jewish people and FINALLY you get to some good stuff at the back about Jewish diseases and Jewish intelligence and the nature of race and ethnicity. But then the author starts discussing Antisemitism, and racism, and he honestly looses his voice. You can't really tell what his point is, because he really just describes things and completely fades under the facts. This is a well presented middle-brow book on the recent research into the genetics of Jews and the contributions genetics has made to paleoanthropology, tracing the migration of Jews through their genes. The book is well footnoted, but if you already have a familiarity with Jewish history, then you can get the same information from a few chapters in _Before the Dawn_, minus all the basic Jewish history you would get from _A Short History of the Jewish People_. Fascinating subject race and DNA! This book (much like the last book--Taboo) treads warily through the mine fields but argues that race is a legitimate construct (especially in medicine). Lots of interesting stories to found in here, but I am not sure what the thesis was. I wonder how it was received? Easy read and interesting if meandering. I would have liked more information about my haplogroup. This book ends up being an apology for looking at DNA. I understand why that is and why the author feels defensive about his subject. But there's more defensiveness in this book than information. It's a long, boring read at the end of which this reader at any rate felt like they got precious little for their time. I thought that the information contained in this book was fascinating, but the science writing was incoherent. I didn't come away feeling that I knew whether the science did or didn't uphold the notion that all Jews are related. I read a lot of it in a beach house on the North Shore of Oahu, so that't not bad. Interesting study of DNA. Started strong and faded for me and I limped into the end of the book, but was glad I read it. I especially liked the personal sections where Jon wrote in first person - as contrasted with some sections that read a bit like a text book. i actually really loved this book. it takes a science-y spin on Jewish historical and cultural myths. the book does take a good lull in the middle, but power through! The end was definitely worth it. I suggest this book for history lovers, theists, athiests, and those interested in geneology. The author tackles a number of big issues, some uncomfortably. I appreciate the insights but I'm not sure I share all his conclusions. I do find the link between our oral histories and genetic "proof" quite interesting. Though a bit repetitive at times, this book was very interesting to me. It shifted the way I think about what it means to be Jewish (or to "be" anything). I feel like I now have a deeper understanding of the physical history of the Jewish people. It's a quick and easy read, and not too technical. I enjoyed this book on many different levels. Someone interested in cancer and other diseases research will like the chapters relating to such. I got this on iBooks for $.99 and would have willingly spent full price. First non fiction I've read in awhile. Very interesting perspective on Jewish history. This will be one of the few titles that I'm going to have to read again -- and soon -- because there are many nuances that I'm not sure that I captured during the first time around. Enjoyable, best in small servings. There is more history and social Science than Biochemistry and Genetics.